Exceptional customer service is the foundation of Huffords Jewelry. Our philosophy is that exceptional customer service starts with finding talented, passionate people who exude the "The Hufford Way". Our fun, casual family oriented culture, combined with top all the tools and training to help you flourish in your career. Huffords Jewelry is a third generation family owned business that has built its reputation on exceptional customer service and unrivaled integrity. We cover all categories of fine jewelry such as fashion, classic, bridal, estate, custom and all jewelry services. Basically anything and everything our customers need. Huffords Jewelry is on the lookout for an experienced sales professional. Do you have a knack for making friends everywhere you go and have a passion for beautiful jewelry? Then being a Huffords Fine Jewelry Consultant just might be your calling! Our compensation structure at Huffords is salary plus commission as well as other team goals and incentives. We strive to put you in a position to succeed, how much you make is up to you! Must be able to work Saturdays (usually every other). Jewelry experience is a strong plus but not required. If you want to wake up energized every day because you have a career that challenges and excites you in a growing family business, follow the link below and submit your resume! Are you cool in the face of chaos? The glue that holds everyone together? Then you just might have what it takes to help manage the fast paced work environment at Huffords Jewelry. With a constant flow of repair services, special orders, custom creations and other jewelry challenges we need people who have a knack for getting things organized and tasks complete. This is a full time salaried position with potential team goal bonuses and incentives. Must be able to Saturdays (usually every other). As the business continues to grow, so does the opportunity to take on responsibility and grow right along with us! If you're ready to start a new career in a unique and challenging industry with a family environment, follow the link below and apply today! You're Mr. Fix-it. You're the guy everyone goes to when they need something fixed or installed. Huffords Jewelry has the premiere jewelry service shop in St. Louis. A bench jewelers paradise where you are given the most updated tools to work with as well as unique and valuable jewelry to repair. 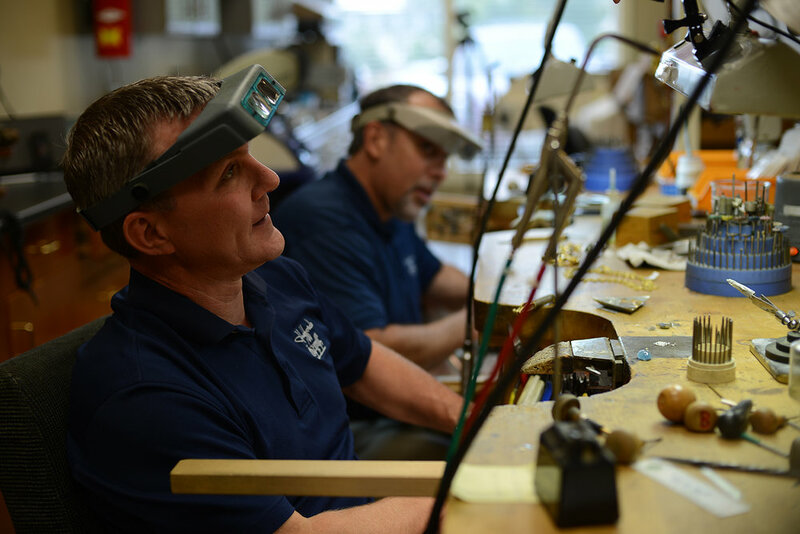 Repairs and other services obviously keep the lights on, but we always want to be on the cutting edge of manufacturing and crafting the most beautiful custom jewelry St. Louis has ever seen. This position is salary with commission and potential team goal bonuses. Early is on-time in your book. You're the person who actually RSVPs for the wedding as soon as you know you can go. Bills get paid on time, expenses don't exceed budgets, and you never forget to pick your friend up at the airport. If this is you, a career as Huffords Jewelry's next bookkeeper and office administrator might be the right spot for you! We're looking for someone to help keep us on budget and organized.